at Tuscaloosa County High School. The other morning I logged onto Facebook for some mindless scrolling while I drank my morning coffee. 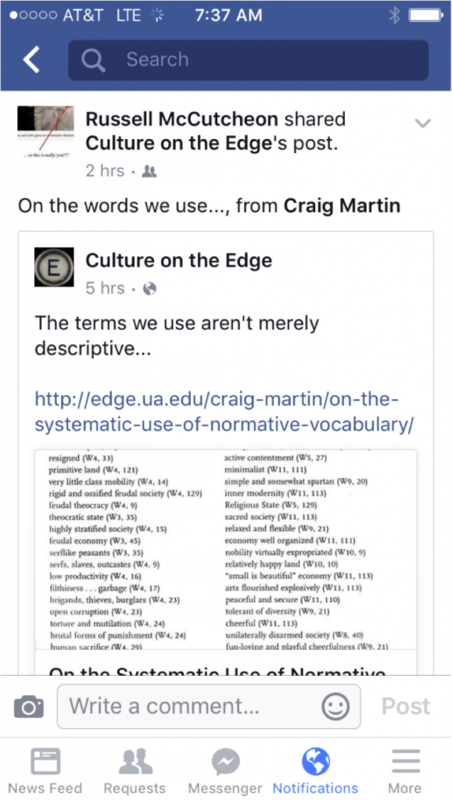 A post by Craig Martin from Culture on the Edge caught my attention. The following conversation then ensued. 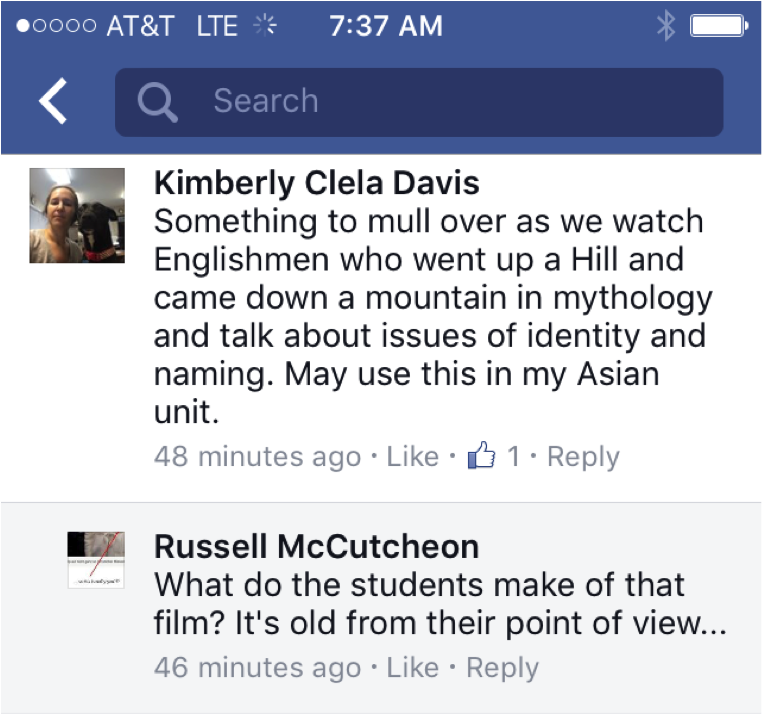 I’ll be very interested to see how this particular group of students reacts to the idea that both the Welsh and the British in the movie The Englishman Who Went Up a Hill and Came Down a Mountain (1995) are imposing a system of classification. 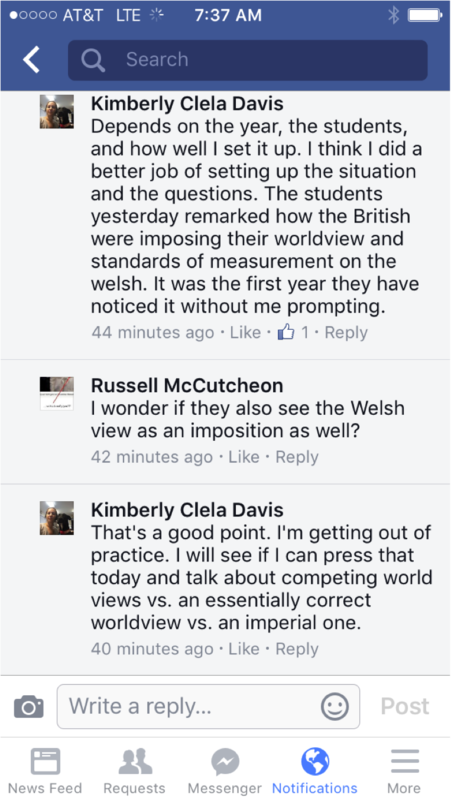 I would bet that they view the Welsh classification as the essentially “right” nomenclature. However, the more important takeaway is that the online presence of Department of Religious Studies and Culture on the Edge are reaching an audience outside of the university world. As a high school teacher, I often feel as if I am losing my critical edge when most of our professional development centers on how to implement the latest policy decision or pedagogical trend. In the secondary school context, we are more concerned with making sure our students can pass the latest end-of-course test, especially since the Alabama legislature has made serious attempts to tie those student test scores to our salary. So I appreciate that these blogs are available on a public format. Between them and the relationships I have with members of the Religious Studies Department, I can fight the “brain drain” and stay engaged in the work I loved during my undergraduate career. I can also make sure that the content I teach my students prompts them to mull over issues of classification and identity, competing worldviews, and mythmaking. I feel very strongly that secondary educators deserve to have the opportunity to engage with theory and critical inquiry at this level. Maybe I can do something about that. This entry was posted in Grad Blog, Relevance of Humanities, Religion in Culture and tagged Classification, Critical Thinking, Kim Davis, Public Humanities, Public School, The Englishman Who Went Up a Hill But Came Down a Mountain by admin. Bookmark the permalink.